Americana Daily: Gene Parsons of the Byrds lends a hand to New American Farmers and their "Brand New Day"
Gene Parsons of the Byrds lends a hand to New American Farmers and their "Brand New Day"
Paul Knowles and Nicole Storto spent most of the last decade performing and recording as Mars, Arizona winning fans with their original brand of cosmic Americana. 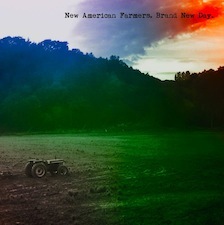 Self-reliance and trust in their sense of independence led to their new name, New American Farmers. Hoping to create a lifestyle and philosophy for themselves and their fans, their new record, Brand New Day, reflects the band’s belief in sustainable approaches to music production and delivery. In the past, the duo has worked with musicians such as Kenny Arnoff, David Grisman, Al Perkins and Billy Block. Some (good) old habits are hard to break and Brand New Day includes their habit of inviting talented, high-profiled instrumentalists to “drop by”. Gene Parsons (Byrds/Flying Burrito Brothers) plays Banjo on the opening track, while Ara Anderson (Tom Waits) reprises his role on trumpet for the song “Don’t Wait For Me Here”. The band shows its lighter side on “Can't Get It Out Of My Head,” the ELO hit stripped of its bombast. Knowles supplies piano and Storto croons a winning vocal supported by The Real Vocal String Quartet and Dave Zirbel’s spirited pedal steel fills. “Hypocrite” is a rocker full of ironic, self-effacing humor, but it makes a serious point about the 1%, while “How Do We Do It” is a bitter meditation on the trials of the 99% given a bare bones delivery by Knowles and his piano, played through a Space Echo tape machine.